You can knit stripes in any size or scale, taking advantage of their versatility to highlight or disguise different figure traits. They can also be used to set off other areas of color and texture. 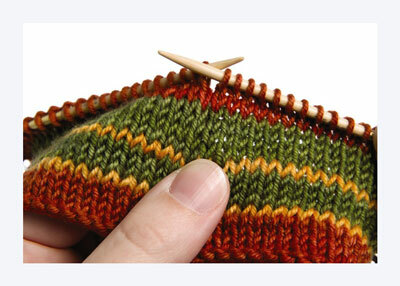 Stripes often add just the right amount of interest when incorporated into designs where other color knitting techniques would be too busy or distracting. With the new color, make a slipknot, and pass the old color through it. 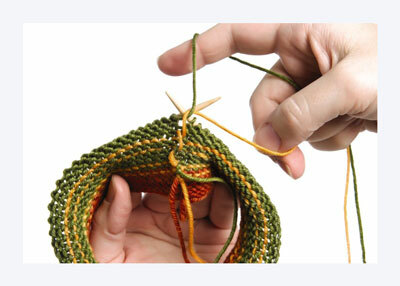 Pass the whole skein of the old color through the slipknot if you don’t want to break the working strand. Snug the slipknot up next to the work where you want the new color to begin. Gently tug the ends of the slipknot apart until the old color pops through (b). Carry (strand loosely upward on the wrong side) the unused color as you knit with the new color so the old one will be close by when you are ready to switch back to it. 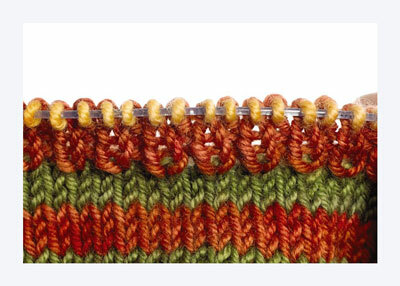 To avoid weaving in extra yarn tails, you can change to a new color without breaking off the old one. After changing colors, carry the unused strand loosely up the back of the work and twist it around the current color to anchor it to the wrong side of the piece. 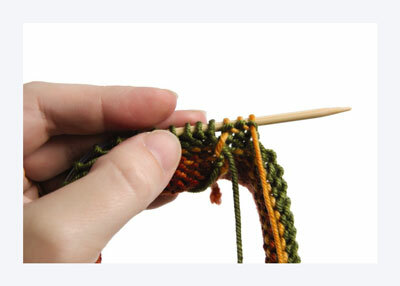 The act of twisting the prior color around the current one is known as tacking. Tack the unused strand at the side edge of the piece every two rows when working flat, or at any interval you choose when working circularly. 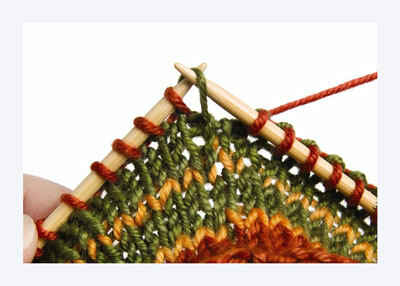 Ribbing and other stitch patterns comprised of adjacent knit and purl stitches present a special challenge to stripe-knitters. This simple technique will keep the colors in your ribbed stripes sharp. 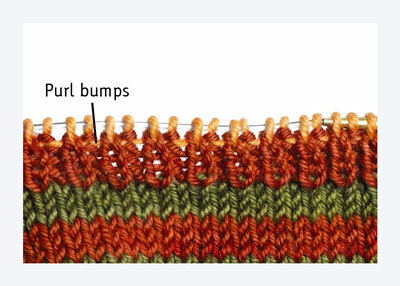 When changing colors in ribbing, the new color can create unsightly purl bumps that are visible on the public side of the work. Rather than maintain the ribbing stitch pattern (in this case, k1, p1) on the color-change row, knit all the stitches in that row. 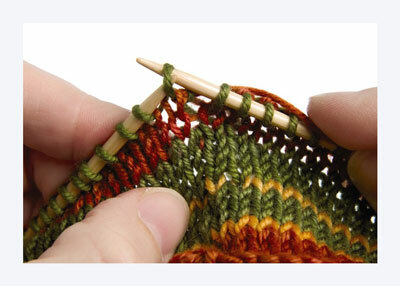 Change back to the stitch pattern on the following row. Circular-knit tubes are made up of rounds rather than rows. Knitted rounds spiral one on top of another rather than stacking evenly as rows do. 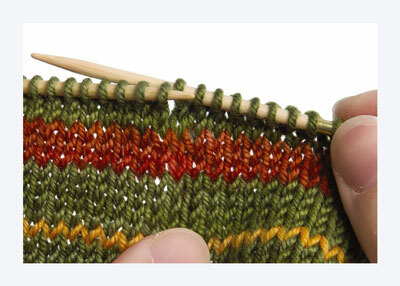 This characteristic of circular knitting causes “jogs” where the color changes in stripes are visible. There are several ways to make the jogs less noticeable. This section shows two of them. Here you can see what happens when changing stripe colors in circular knitting. 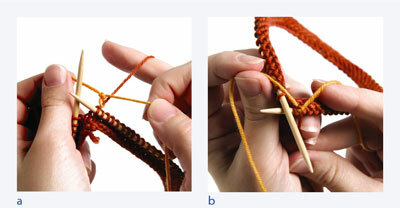 Each time a new round begins with a new color, you can see a stair-step or “jog” in the knitting. These stripes were knit using a technique to minimize the appearance of the jogs. This technique for minimizing jogs is especially useful for very narrow stripes. The first stripe is complete, with one full round of the second stripe knitted. Pick up last st of prev color and place it on left needle, right next to first st of new color. Knit the last st and the first st together. The jog will be visually softened and minimized. Blocking the piece at the end of knitting helps make the jog even less noticeable. When planning stripes, take your construction technique into account. 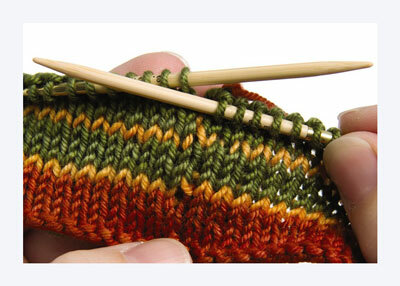 If you will be knitting flat, choose stripes with rows in multiples of 2. For circular knitting, stripes in any number of rows will work. Another way to disguise jogs is to slip one stitch. This technique makes jogs in wide stripes nearly invisible. Here the first stripe is complete, with one complete round of the second stripe knitted. 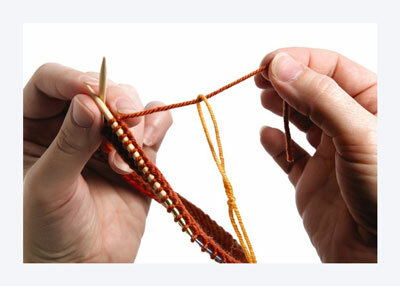 When you come back to the beginning of the round, slip the first stitch to the right needle purlwise, without actually knitting it. Yarns with both elasticity and tooth (surface fuzz that grips itself), such as 100% wool, make it easier to disguise jogs. Superwash wool and slippery fibers can be less forgiving.